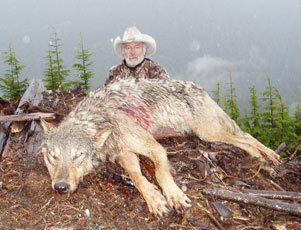 Wolf inhabit both our Vancouver Island and Knight Inlet areas and can be combined with a fall grizzly or elk hunt. Wolf can also be combined with a spring black bear hunt. The only expense to our clients for harvesting a wolf is the cost of a species tag. We encourage our clients to purchase a wolf tag and participate in our ongoing ungulate enhancement program.